We are pleased to have Andrew Pudewa from the Institute for Excellence in Writing join us as a main speaker for the 2019 Oregon Christian Home Education Conference! IEW is also partnering with OCEANetwork to host a fantastic 1-day event for Oregon homeschoolers the day before our conference! Join us for the IEW High School Essay Intensive on June 27th. 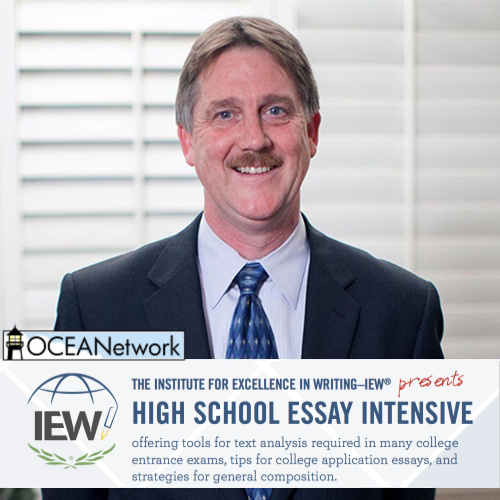 Registration for the IEW High School Essay Intensive is open NOW and is separate from registration for the OCEANetwork conference, which opens April 16th. Open to all students regardless of their experience with IEW courses or methodology, this seminar also offers tools and tips for general composition skills. Come prepared with pen and paper to write multiple essays and outlines during this six-hour class. Parents are welcome to attend at a reduced cost. We hope you and your high school students enjoy this opportunity!